Galileo was the first to observe the surface of the Moon in great detail, which he described as “full of cavities and prominences”. This was at odds with Aristotle’s view that the Moon and all the heavenly bodies were perfectly smooth. When he observed the stars through his telescope, he saw at least ten time as many stars as he could see without his telescope. He saw that nebulous clouds in the Milky Way were actually collections of many stars that were too small and close together to be seen individually with the naked eye. 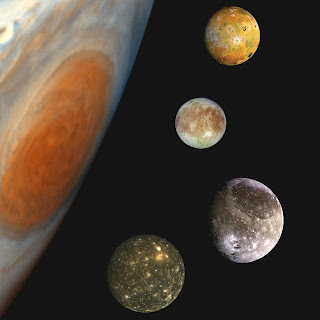 Io, Europa, Ganymede and Callisto. Galileo was also the first to view the four largest moons of Jupiter, now known as the Galilean moons: Io, Europa, Ganymede and Callisto. The discovery of celestial bodies orbiting something other than the Earth was at odds to Ptolemy’s age-old theory of geocentrism, which placed the Earth at the center of the universe with all the heavenly bodies orbiting around it. An even bigger blow to geocentrism came when Galileo studied Venus. He found that it went through phases, similar to the phases of the Moon. From this he reasoned that Venus must be orbiting the Sun. This evidence proved Copernicus was correct when he dared write—70 years prior—that the Earth and all the planets orbited the Sun. Heliocentrism may be taken for granted today, but at the time it was considered heresy. Galileo was eventually put on trial by the Inquisition and forced to recant his views. And even though he spent the last several years of his life under house arrest for his beliefs, the genie was already out of the bottle. No longer was man at the center of the universe—the Scientific Revolution had begun. 1) True or false: Using his telescope, Copernicus was able to view mountains and craters on the Moon. 2) Geocentrism was championed by ___________________. 3) True or false: Venus goes through phases similar to the Moon. 4) Heliocentrism was championed by __________________. 5) Heliocentrism is the model whereby the _________ and the planets revolve around the _________.